Google Forms - Choose from a bunch of question options, from multiple choice to dropdowns to a linear scale. Add images and YouTube videos, or get fancy with page branching and question skip logic. Uses: Place your assessment created in google form on your students' google classroom. Create assessments with pictures, youtube videos for sound examples, multiple choice questions, short answers, long answers, linear scales, dropdown boxes, and check boxes. Kahoot! is a free assessment tool in the form of a game. Once you create your free account, you can search for numerous music games or create your own. These games can be used to assess the students’ knowledge on their concert music, lyrics, note names, rhythm names, and so much more. You can use Kahoot! as a fun way to assess almost anything you have been teaching in music class. And, the students love it! Kahoot! can be used on Chromebooks (kahoot.it turns the Chromebook into an answering device), iOS devices, Android, desktops, etc. It can be used in a 1:world classroom as well as a classroom with limited devices (set the game to group mode). The students do not need email addresses to participate in a Kahoot! game. You can also send a “Kahoot! Challenge” to your students’ devices for them to participate from home by a certain date and time. Nearpod - Nearpod is an interactive classroom tool for teachers to engage students with interactive lessons. Uses: There are ready-to-teach interactive lessons to use immediately in the classroom. You can also easily create lessons in minutes for your next class. Import files (pdf, ppt, jpg) or Google slides and add interactive activities, websites, and videos to keep your students engaged in their learning. Finally, you can synchronize your lessons across all student devices in the classroom and receive real-time feedback and post-session reports on student comprehension. Quizizz - Free self-paced quizzes to review, assess, and engage—in class and at home. Similar to Kahoot! Quizlet - Quizlet (free+) offers tools for students to make flashcards, practice concepts, play learning games, test their knowledge, collaborate with other students, and more. Uses: Socrative works as well and I tend to use it for more formative assessments. Uses: Use this tool to show meters as well as having students move to the meters. In addition, have a student create a rhythm pattern within in the meter. 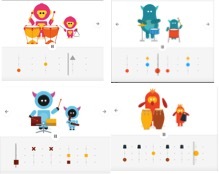 For older elementary, students can decode the rhythm pattern that was created on screen. Sound Waves: Built by Mark Lundin. This consists of an exploration and visualization of a sound wave moving through air molecules. Uses: I use this activity to introduce a STEAM unit. I collaborate with the science teacher as we work together on teaching about sound and music. With Sound Waves, I have a student play the keyboard provided in the app and they watch the blue dots move. The blue dots represent air moving through molecules. The higher the pitch, the faster the air moves. When the magnifying class is clicked, a red line will appear that draws the shape of one molecule moving through the air. Kandinsky: Built by Active Theory and inspired by Russian abstract artist Wassily Kandinsky. This app turns anything you draw into sound. Uses: Have the students draw a pattern on paper. This pattern can include shapes and lines. Set a guideline such as two shapes and three lines so that they can perform all of their drawings. Have the students draw their pictures into the app and listen to the results. Ask them if they thought if it would sound the way the Kandinsky app played it. In addition, make the cross-curricular connections with learning about the artist in art class. Song Maker: Built by Google Creative Lab, Use All Five, and Yotam Mann. This app can make simple songs with melody, harmony and rhythm. The songs can be shared via a link or social media, where others can collaborate and add to or change the song. Click the “Settings” button to determine the song’s length, beats per bar, subdivisions, scale (major, minor, pentatonic), tonic, and range. Uses: You can create a melody in the app, like Lucy Locket, and have the students try to identify the melody. Then hand out boomwhackers and have them perform the melody. Song Maker uses the colors that are closely related to boomwhacker colors. You can show a visualization of beat subdivisions by creating a song in a simple, triple meter and having the “Settings” show “Beats per bar 3/Split beats into 1”. Have the students or the teacher create a melody when the notes will appear as dotted half notes. Then go back into the “Settings” and change “Split beats into 3”. The melody now changes and shows the subdivision within each measure. Sharing the Song: When finished, click the “Save” button and the app will generate a link. The students can share this link on your music classroom’s Facebook or Twitter page. You can also copy the embed code to embed in a music classroom webpage. Finally, the students can copy the link and email you the link (if you do not share your email address with your students, consider setting up a gmail account just for students to send you work, ie examplemusicteacherschoolexample@gmail.com), place the link on their Seesaw journal, or place the link on their Google classroom. Finally, share the link with another elementary music classroom and have the students collaborate and comment on each other’s musical work. Color Piano - There are pre-loaded songs that the students can watch, via a color piano roll. Great for students to visually see patterns in music. Flipgrid - Flipgrid is where your students go to share ideas and learn together. It’s where students amplify and feel amplified. It’s video the way students use video. Short. Authentic. And fun! That’s why it’s the leading video discussion platform used by tens of millions of PreK to PhD educators, students, and families in 150 countries. Your classroom is next! Uses: I have seen music educators use Flipgrid for students to submit recorder (or recorder karate) videos. Flipgrid has many different settings that encourage digital citizenship amongst students. It can, essentially, turn your classroom into a social media classroom that would appeal to them. Google Classroom - Classroom is a free web service for schools, non-profits, and anyone with a personal Google Account. Classroom makes it easy for learners and instructors to connect—inside and outside of schools. Uses: If your school has students utilizing gmail, then this is a wonderful tool for enhanced learning. You can set up a google music classroom where students can find resources, assignments, and submit work directly to you. Google Classroom makes it easy for you to create and assign activities to the entire class or to certain students. You can also use it to flip your classroom where the students watch the videos assigned or read the articles assigned before they come to class. When it comes to submitting videos, it can be tricky depending on the devices your students are using to access their work. Seesaw (http://web.seesaw.me/) - Web, cloud, and app-based student-driven portfolios. This has been a game changer in my classroom. Showcase your student work and bring your classroom to your parents' mobile devices. Check out my webinar about Seesaw to learn how to use it today! Uses: The Activities can be used for assessments and as a virtual classroom. There are numerous uses in the elementary music classroom. Take a look at the webinar. ClassDojo (https://www.classdojo.com) - ClassDojo began as a classroom management tool for teachers, parents, and students. It now includes student portfolios. Uses: Great way to assess students on note reading skills. Learn Music Notes Sight Read Music Flash Cards - This is a simple note reading app. Uses device's input or microphone to pitch track playing notes! Learn music notes and sight reading using real instruments like piano, guitar, violin or your own voice! You can also use buttons with note names or virtual piano keyboard. Uses: Place the settings to note names, G Clef, Level 1, and have the students name the notes on the G-Clef Staff. They can name them by pressing the coordinating note name, singing the note, or playing the note on an instrument. The only problem I foresee is that on the chromebook, you cannot completely see the notenames. You will have to remind the students that the note names for this particular game is E G B D and F.
Uses: This app is for older elementary. You can go in the "Options" to filter some items. You can make this just treble or bass clef, as opposed to both clefs. You can use note names or solfege. You can set the level from easy, to intermediate, or advanced. In addition, you can turn off the flats and sharps. The app also plays the note on the staff as well as plays the note that you press, and you can turn that option off as well. Finally, the app allows the student to view mistakes. Though not as entertaining as Staff Wars, it is a good, free app for assessment purposes. Have the students write down their score , accuracy, and total points (create a sheet for them to do this) when the game ends and then restart the game to beat their score , accuracy, and total points. At the end of the class, you collect the sheets that they recorded their score , accuracy, and total points to utilize as data for their assessments. Uses: Assess students on their knowledge of various staff's note names. They can write down their score and level when the game ends and then restart the game to beat their score and level. At the end of the class, you collect the sheets that they recorded their scores and levels to utilize as data for their assessments. http://www.incredibox.com - Have your students easily create their own beat-boxing acapella group! Uses: Students use Incredibox to create accompaniments to raps or poetry that they author. Currently, this website is flash-based. For some schools, they have blocked flash-based websites on the students' chromebooks. http://buttonbass.com - Similar to incredibox as your students can easily create music with cubes. http://www.musictechteacher.com/ - Karen Garrett’s website for her 2nd through 5th grade students who are learning to read, write, compose and publish their music to CD's and the Internet. Student work, pictures and music compositions are on this site. The site is also used to provide music technology links, quizzes, resources and information to all music teachers interested in using technology to enhance music instruction. Uses: Check out the quizzes and games section. There are many that assess the students' musical skills as well as making it a lot of fun for them. 123apps.com - All free! No logins and no limitations! PDF Tools - When you click on PDF Tools, it brings you to another page full of essential online PDF tools. There are many conversion tools from Word to PDF and PDF to Word doc, as well as excel conversions, jpg conversions, splitting PDFs, and merging PDFs. Audio Cutter - This free online app can be used to cut audio tracks right in your browser. This audio edit tool is quick and stable, with over 300 supported file formats, includes fade in and fade out features, and has ringtone quality presets. You can access files directly from your hard drive, Google Drive, Dropbox, or a url. Audio Cutter Pro - A free online app that can be used to edit multiple audio fragments simultaneously. The app features waveform zooming. Waveform zooming feature allows you to cut audio tracks precisely and makes it easy to handle long tracks. It also allows editing and fades. Audio Converter - A free online app that converts audio files for you. This app supports most formats, processes your files quickly, and does not require any sort of download or installation. The converter works with over 300 different file formats including video formats, converting them to mp3, wav, m4a, flac, ogg, amr, mp2, and more. Just upload the original file, choose your format and quality, and download the output file to your computer or Google Drive. Audio Joiner - А free online app you can use to join multiple audio tracks into one. It supports most popular file formats. It also includes crossfades and unlimited tracks. Video Converter - A free web app that converts video files, allowing you to change the video format, resolution or size right in your browser. You can upload files up to 2Gb in size and the app supports more than 300 video formats, and the number keeps growing. Think Zamzar, but without the limitations of how many items you can upload in one day! Video Cutter - This web app comes in handy when you need to cut a small video file. It does not require installation, and it works in your browser. You can rotate, crop, and edit your videos. Files of up to 500 Mb are supported, and they state that they are about to raise this limit! Voice Recorder - This is the one mentioned in the webinar. Voice Recorder is a convenient and simple online tool that can be used right in your browser. It allows you to record your voice using a microphone and save it as an mp3 file. You can also crop the recording. The app is intuitive as it can automatically edit out silence fragments found at the beginning and the end of your recording. Video Recorder - This online app for recording video and taking pictures right in your browser. This simple app has flexible video and audio settings. It can process your files quickly, and allows you to work with files of any length. The app can record videos of unlimited length. You can save your output video file on your computer or in Google Drive or Dropbox. Archive Extractor - Archive Extractor is a small and easy online tool that can extract over 70 types of compressed files, such as 7z, zipx, rar, tar, exe, dmg and much more. http://www.whalesynth.com/ - Experiment with sound by creating whale songs. Uses: Many of the items you can use to create whale songs have wonderful STEAM connections. https://www.screencastify.com/ - Students use this to record their chromebook screens. Uses: A great way to show the process students are taking when they create music.